Happy Holidays! Hope you are recovered from your turkey-tryptophan feasting activities. This post has a couple of quick to knit holiday ideas for you, plus one bind off technique that will become your favorite! This cute little scarcho was knitted by Bertha for her niece, Cassie. Cassie is 8 years old, and loves the color pick. 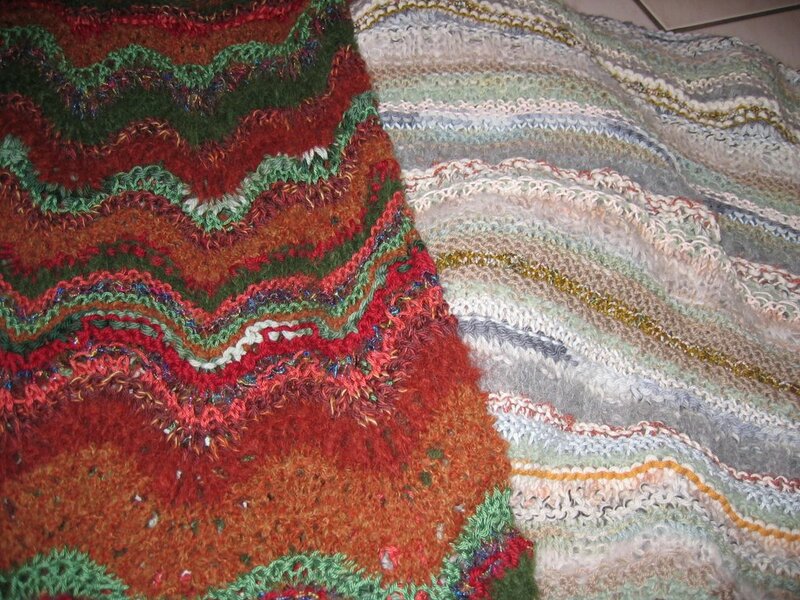 Bertha used one skein of Lourdes by Sensations (49 yards) and one of Tropez (38 yards. 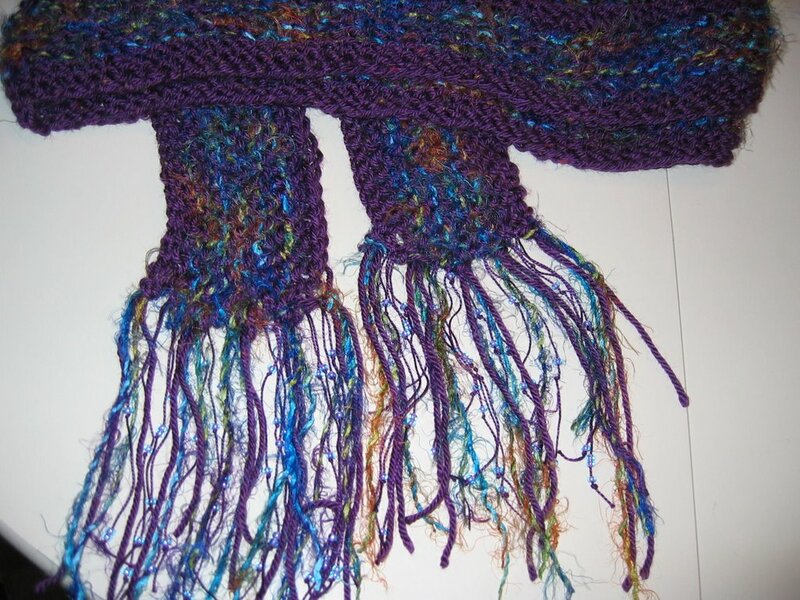 She cast on 10 stitches, I believe she used a size 11 needle, and knitted 4 scarves from each yarn, 40 ridges long. That’s it! Join them together, fringe, and your niece will nominate you for Aunt of the Year! With some of the sales going on at this time of the year, you can make this for under $10—waaaay under $10! 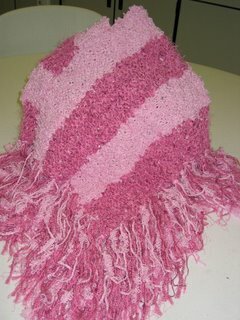 This is the pattern that Helen had last Sunday–it is called “Scarf in a Flash”. And I do mean in a flash. I used one skein of Caron’s Simply Soft Tweed(a worsted weight) (150 yds), and one of a “fancy” yarn (I forgot the brand, it was only about 89 yards). Using a size 11 needle, cast on 200 stitches with your basic plain worsted weight. Knit 4 rows. Add the fancy yarn, knit 8 rows. Cut the fancy yarn, knit 4 more rows. I bound off using the Icelandic Bindoff (instructions follow). I finged it sparingly with one strand of the fancy and plain held together. 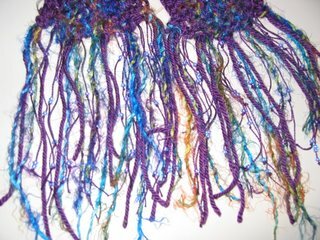 What I did next really sets off the scarf, and it was both inexpensive and quick-I added beads. 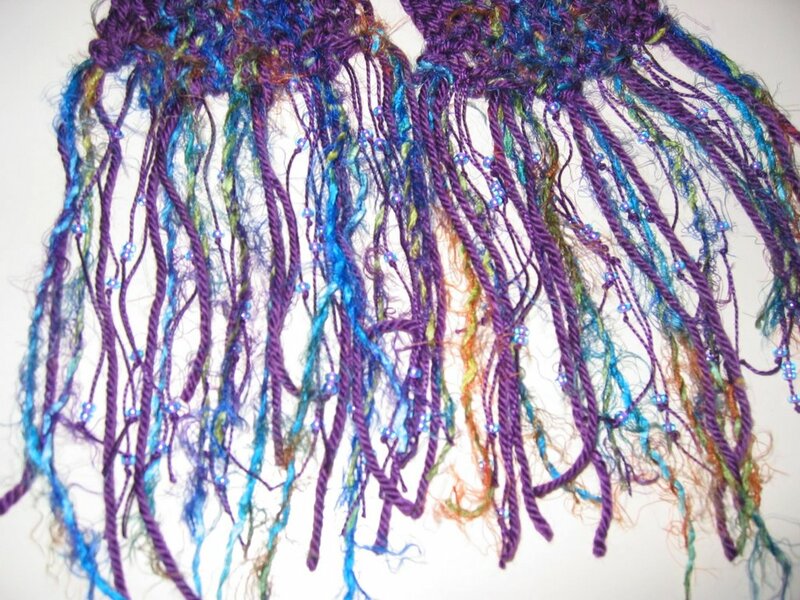 To add beads, you need to buy one small skein of the yarn used for needlepoint, some beads, and a small crochet hook. I used a size 13 crochet hook, and one tube of 6/0 Czech glass beads. Between each yarn fringe, I added 2 beaded fringes. Cut the needlepoint yarn, and tie 2 overhand knots at the end. Using the crochet hook, pick up 6 beads on your crochet hook (or however many you want). 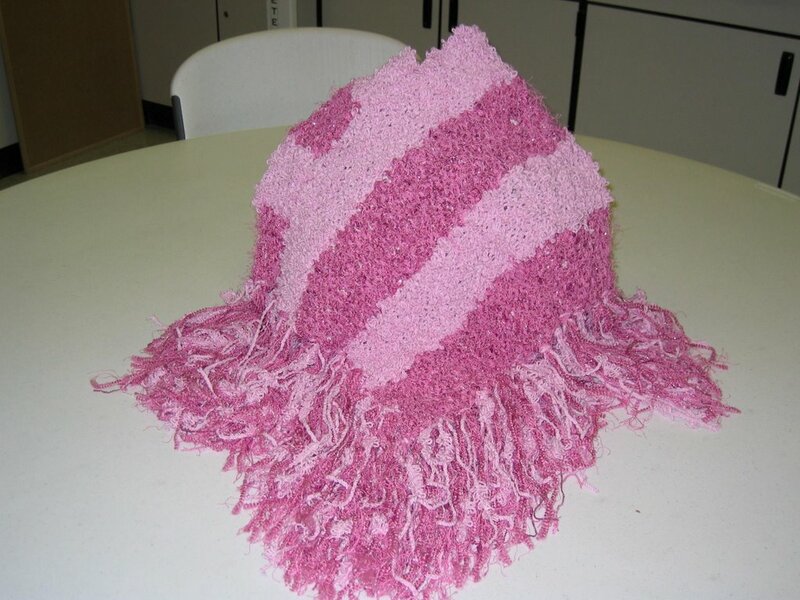 Pull the yarn through the holes in the beads. Double knot the other end. 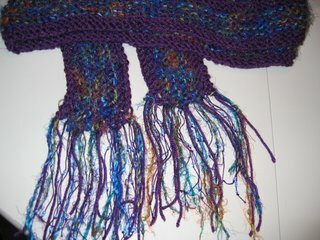 I moved 3 beads to each end, and added the fringe to the scarf. I put two of these side by side between the yarn fringe. I then tied single overhand knots to position the beads at different levels. They really add a lot to the scarf. The whole venture was less than $12. (read:more money for cashmere!) I will bring it next Sunday. back on the left needle. 2. Now, reach your right needle through that stitich on the left needle (the one you just made), and knit into the 2nd stitch. Go ahead and pull it through both stitches (peek through BOTH windows), then Off Jumps Jack. 3. Now put the stitch on the right needle back onto the left, just like before. Repeat stelps 2 and 3 until you reach the end of your piece. Cut the yarn and pull through the final stitch. Voila! Now, for the truly SERIOUS Knitter! You can still listen to this, even if you don’t have an iPod. You will need to download iTunes, it is free, and also available for Windows machines. Roll your cursor over the title for this blog entry, and click–it takes you to Cast-on, series 1, episode 2, “The Knitter’s Manifesto”. It’s a GREAT listen. Imagine–what if Knitters took over the World. This podcast is free, and Brenda Dayne has a wonderful voice. You will like it.